Toomey & Co. has been holding its auctions in the village of Oak Park, Illinois for 30 years. Just west of Chicago, Oak Park boasts a storied past, but there is much more to the village than history: it is modern and thriving in the present. We spoke with our Web Content Manager, Nick Stenzel, who lived in Chicago for two years prior to joining Toomey & Co. recently, to get his impressions on Oak Park as a relative newcomer and learn about the local culture that he has made a point of exploring. How does your experience of Oak Park so far compare to any expectations you had in advance? In Chicago, like any city, sometimes it’s easy to stay in your comfort zone or get stuck in a routine. Until this year, I lived and worked on the North Side exclusively, so venturing beyond that generally meant just going downtown or to certain neighborhoods on the West Side. Even though I had heard good things about Oak Park, I didn’t visit until interviewing with Toomey & Co., which is strange because it’s only eight miles due west of Chicago. Plus, I have a car and both the “L” Green Line and Metra Union Pacific West trains stop right in the middle of Oak Park. Before I came, I thought it would be a nice suburb, maybe somewhat sleepy, which is hardly accurate. In addition to rich history, there’s quite a lot going on now in terms of residential and commercial development, which adds to the existing charm of the shopping district along Lake Street. 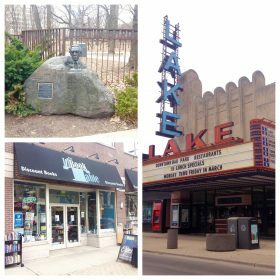 At this point, I think of Oak Park as kind of a hidden gem on the edge of Chicago. People who are younger or recent transplants to the area might never have visited either and I think they’re missing out for sure. What have you done to try to experience Oak Park first hand? After working at Toomey & Co. for a few months, I felt like it was time to immerse myself locally with respect to Oak Park’s two most famous residents, Frank Lloyd Wright and Ernest Hemingway. Even though Wright is synonymous with the Prairie School of architecture, there were many other famous practitioners, such as George Washington Maher, William Eugene Drummond, Marion Mahony Griffin, and Joseph Lyman Silsbee. As for Hemingway, many are aware that he was born in Oak Park, but he actually spent the first 20 years of his life here. Walking around the neighborhood, you can sense history living in the present. Wright, Hemingway, and other esteemed residents certainly left their mark on Oak Park’s physical environment. At the same time, the village is a place where architectural styles from different eras mix freely, where gourmet restaurants, chic boutiques, and family-owned shops sit side by side, and where the population of over 50,000 is rather diverse. You don’t get the sense that Oak Park is standing still. It seems committed to preserving the past while charting a bold, lively, and inclusive course for the future. 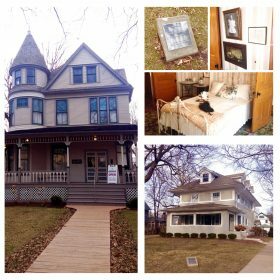 Why don’t you tell us about the Oak Park cultural tour that you took? Designed by celebrated Prairie School architect George Washington Maher, the stately Pleasant Home was finished in 1897. It was originally built for John Farson, a rich banker who could have been the archetype for the Great Gatsby given his penchant for flamboyant dress and throwing lavish parties. In 1910, following Farson’s death, Herbert S. Mills, who sold amusement and novelty machines, purchased the residence. By 1972, Pleasant Home was turned into a public museum and listed on the National Register of Historic Places. Procured by Toomey & Co. Upon entering Pleasant Home, I was struck with all of the lights! Apparently, Farson wanted the foyer to bring to mind Chicago’s famous Auditorium Theatre. Because Farson entertained so often, he pulled out all of the stops to impress his guests. On the landing halfway up the central staircase, he positioned musicians, whom he preferred to screen with a curtain to create an air of luxurious mystery. Throughout Pleasant Home, Maher repeated a distinctive shield motif in every room. It is intriguing to discover how Maher varied and recast the emblem for different settings. Upstairs are the master bedroom and smaller bedrooms for the Farson/Mills children. The downstairs rooms are preserved in accordance with the original style, although most of the furniture pieces are replacements. 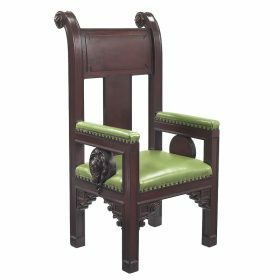 As it so happens, Toomey & Co. helped Pleasant Home recover one of the original dining chairs. Beyond the dining area is a grand circular porch that looks out on the grounds, which is now Mills Park. I visited on a mostly sunny day, which gave me a chance to admire the exterior at length and observe the interplay between older architectural style elements and the extended horizontal emphasis of the Prairie School. Wright finished his first home at the intersection of Chicago and Forest Avenues in Oak Park in 1889. He was working for the famous firm of Adler & Sullivan at the time and felt ready to branch out as an architect. Wright added a connecting studio to the home in 1898. It was here that he elaborated and began to practice what would become known as the Prairie School of architecture. 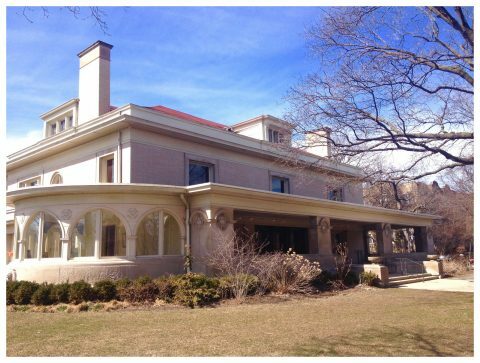 Not surprisingly, Oak Park has more homes designed by Wright than anywhere else. Compared with its grand neighbors on Forest Avenue, Wright’s Shingle-style home and studio are relatively modest. The interior of both Wright’s home and studio offer intentionally separate domains. While the individual rooms flow into one another, they are also self-contained spaces. I was impressed with the fireplace you encounter after entering. It has seats on either side, which I hadn’t seen before. In the dining room, Wright incorporated high, built-in cabinetry and a signature upright dining table with high-backed chairs of his design. With the overhead lighting concealed by a wooden grate, Wright created a ‘room within a room.’ This was a concept that he repeated often in his buildings. The upstairs master and children’s bedrooms are small but cozy. The biggest room is actually the children’s playroom, which Wright also used to entertain guests. The room feels almost like a miniature theater or church and has a baby grand piano placed within a cutout in the wall. Above it all is a mural depicting a scene from one of Wright’s children’s favorite books, Arabian Nights. As for the studio, Wright positioned several drafting tables under an octagonal pitched roof supported with thick, perpendicular chains. Rather than conceal this within the structure, as previous architects tended to do, Wright made this part of his design. Another curious feature of the studio is a heavy-duty metal safe for storing architectural plans and drawings. In the aftermath of the Great Chicago Fire (1871), many homeowners and businesses were extra cautious with anything valuable and flammable. In the lobby outside the studio, Wright would greet clients under beautiful leaded glass windows and then lead them into his library for presentations. 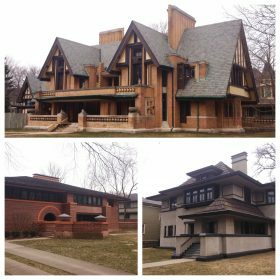 Within Oak Park and adjacent River Forest, there are 35 homes that Frank Lloyd Wright designed between 1889 and 1913. In terms of styles, these range from Italianate to Queen Anne to Arts & Crafts to Prairie and more. In central Oak Park, there are 14 homes for which Wright is famous. Rather than go on the official tour, I bought a comprehensive map and walked the area to get an overview. 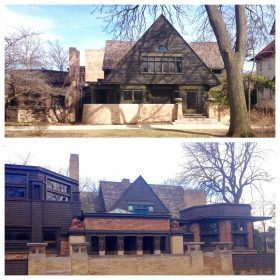 My three favorite Wright-designed residences were the Nathan G. Moore Home (1895/1923), which combines Tudor elements with more elaborate modern touches, the Arthur B. Heurtley Home (1902), which is a low-to-the-ground, brick Prairie fortress, and the Edward R. Hills/Decaro Home (1906/1977), which seems to typify the Prairie style’s timeless appeal. Just steps from Toomey & Co., Frank Lloyd Wright’s iconic Unity Temple greets visitors squarely in the center of town. Wright was a member of the local Unitarian congregation whose former church burned down. He was commissioned to build a new church in 1905 and work was completed in 1908. The structure was groundbreaking at the time and still inspires architects today. It was Wright’s first public building (bookended with the Guggenheim Museum in New York City, which was completed in 1959). Unity Temple exemplifies Wright’s theory of ‘organic design’ wherein the building uses natural materials like concrete while favoring geometric shapes and a horizontal orientation. 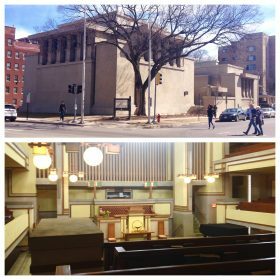 Today Unity Temple is the last remaining public building of Wright’s in the Prairie style. 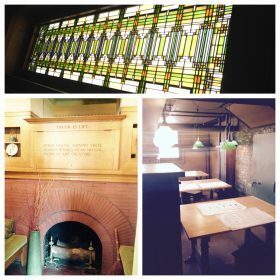 What stood out to me most inside Unity Temple was the earthy color palette: pastel yellow, green, and brown. Combined with the wood of the pews in the sanctuary, it feels as if you’re both inside and outside at once. The frosted globes and the skylights in the sanctuary and across the lobby in Unity House create a diffuse glow that is calming and conducive to reflection. Although I wasn’t initially a big fan of concrete exteriors, over time they’ve grown on me. Wright’s technique with Unity Temple was interesting in that the concrete was applied in horizontal bands, so for many years it had a wavelike appearance. Back in the 1970s and again recently, though, Unity Temple’s exterior has been sealed with Gunnite (i.e., sprayed concrete) that has small pebbles mixed in to create a textured effect. In 1899, Ernest Hemingway was born in a tall, dignified Queen Anne-style home on Oak Park Avenue. His mother was a former opera singer and music teacher. His father was a local doctor. As such, young Ernest and his sisters were raised in material comfort, although their lifestyle was not exactly decadent. From his grandfather, Hemingway learned his gift for storytelling and went on local adventures, including fishing in the Des Plaines River. When Ernest was six, the family moved a few blocks north to Kenilworth Avenue. His mother was a modern woman and she wanted to have a home that expressed as much. As a longtime admirer of Hemingway’s writing, I was excited to see where and how he grew up. Learning about his life of privilege and his mother’s dominant personality offered context for the rugged, macho literary figure he would later become. I also found it revealing and a bit sad that Hemingway never returned to Oak Park after age 29, when he attended his father’s funeral. Within Oak Park, Toomey & Co. is located in what is called the Hemingway District given its proximity to the Hemingway Birthplace. There are various restaurants and shops nearby as well as picturesque Scoville Park and the large, well stocked Oak Park Public Library. We’re also just a couple minutes walk from the Oak Park stop on the Green Line, making coming and going extra convenient. West on Lake Street is the more highly concentrated commercial area of downtown Oak Park. Here again are quite a range of restaurants and shops. When I did my tour, I browsed for a while in The Book Table, which is independent, locally owned, and offers detailed recommendations on its shelves. I followed that up with an Indian dinner buffet at Khyber Pass before heading over to the well preserved, Art Deco-style Lake Theatre, where I saw the blockbuster Black Panther for only $8.50. Just north of the main commercial area is Austin Gardens, which contains a bust of Frank Lloyd Wright and acts as the gateway to Forest Avenue, where you’ll find Wright’s home, studio, and some of the famous residences he built. Finally, what would you say to those who haven’t been to Oak Park before or haven’t visited for a while? Again, I’d reiterate that there’s more to Chicago than The Loop, River North, Wicker Park, or Lakeview. If I hadn’t joined Toomey & Co. this year, it’s hard to say how long I might’ve waited to experience all of the great offerings in Oak Park. Coming here presents the advantage of a cool day trip that’s only 30 minutes from the city. And even though the auction business has gone increasingly online, we’re looking to turn our sales into events again. So by all means, people should feel free to attend and, while they’re here, do some exploring of their own.